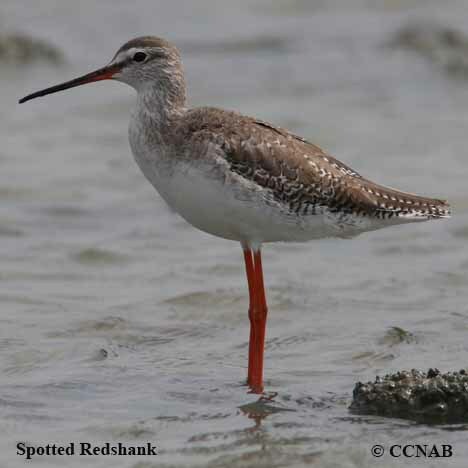 There are at two types of redshanks that have been seen in North America. Both bird species are native to Eurasia and have shown up on the continent as vagrants. These are the Common Redshank and the Spotted Redshank. Both birds can be identified by their long dark orange to reddish legs. Of the two,the Spotted Redshank is more easily recognized by its black breeding plumage, longer red bill and its long reddish legs. The Common Redshank, somewhat smaller in size and not as an attractive plumage, has a shorter red bill but also has long red legs. Both redshanks nest in the northern regions of Eurasia.